PopPopMan.co.uk - launched in 1912 and still going strong! Launched in 1912 and still going strong! I am always interested, when I come across a new pop pop boat hitting the market. It must be said, however, that most of the current models, being produced, (mainly in India) are variations on designs that have been around for decades. 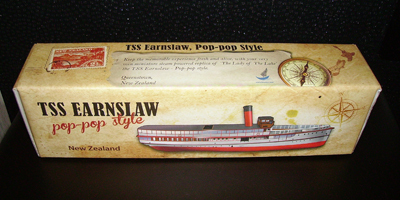 So, I was excited when I came across a boat, that was not only new to the market, but was a replica of a real working steamboat, the TSS Earnslaw. (TSS = Twin Screw Steamship). 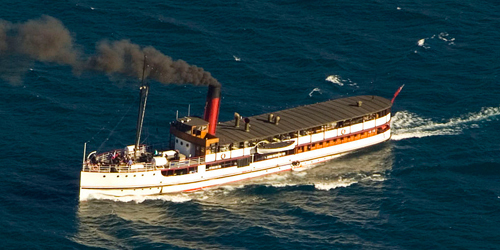 This marvellous old steamboat, launched in 1912, still operates on Lake Wakatipu, in the South Island of New Zealand, today. The following is based on email correspondence with the supplier and gives an insight into the creation of the "pop pop style" replica. 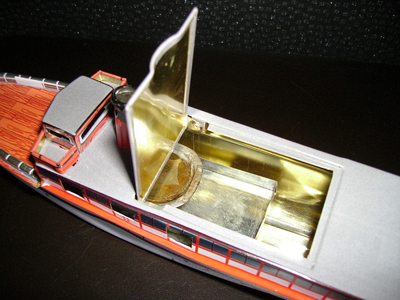 "They’re a neat little boat, made from 100% recycled tin. 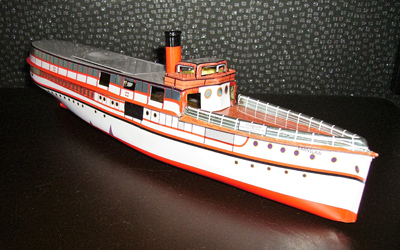 I’ve manage to harness the older technology – the pop pop engine, making it as similar to the actual steam ship the TSS Earnslaw based in Queenstown, as much as possible. It was a really fun process to have the little boats come to life, the design process itself was the one that took the longest, as I wanted to keep the boat as ‘replica’ like to the original, however simply shrinking it down to a 30cm model, wasn’t going to work (it would have floated upside down). So I hired a specialised marine designer, and he carried out a number of small alterations to the design, making it so that when we added a candle, the boat would float (and up the right way!). Finding a manufacturing company too was a bit of a struggle, with the advancements of plastic, tin toys are becoming more and more rare, manufacturers even more so. I finally found one, flew over and met with the owner and checked out the processes. It was great, the people were very lovely, creating things by hand, they were so proud of their work – this was exactly what I was looking for. The boat comes with everything you need to get it going. Simply use the eye dropper to put water into the boiler tubes, place in the water and add a candle, light, and away it goes." The boat comes in an excellent illustrated box and beautifully designed information scroll. Check out BoatNZ.com for more information.